The over-blown Adam-style fans can be seen among the extended sidewalk awnings. Among New York City’s fabulously wealthy citizens, it was the Astor Family that was known for its hotel building. Beginning with John Jacob Astor’s exclusive 1836 Astor Hotel on Broadway to the hulking Waldorf-Astoria and then to John Jacob Astor IV’s luxurious 1901 St. Regis Hotel and 1906 Knickerbocker Hotel, the Astor name was as synonymous with hotels as it was real estate. But the Vanderbilts had a slice of the hotel pie, too. In 1911, as architects Warren & Wetmore were completing one Vanderbilt project—the new Beaux Arts-style Grand Central Terminal that straddled Park Avenue at 42nd Street—they were called upon to start another. Alfred Gwynne Vanderbilt envisioned an enormous upscale hotel conveniently located to the new terminal, just six blocks south on Park Avenue. “Freddy” intended it to be done with true Vanderbilt class. Alfred Gwynne Vanderbilt would meet an untimely, but heroic, end. Touted as fireproof, the building’s elegant façade would be clad in terra cotta fabricated by the New Jersey Terra Cotta Company. Unlike the innumerable Beaux Arts structures appearing throughout the city with their lush garlands of fruits and flowers, and frothy embellishments, the Vanderbilt Hotel would be refined and classic, harkening back to 18th century England. The Sun, on March 17, 1912, gushed with approval. “Everything has been made to correspond with the Adam period of English design intended to be worked into the building.” The architects treated the ground floor windows with over-blown Adam-style fluted fans. Inside, painted panels and delicate plaster ceiling ornaments echoed the period. But despite The Sun's assertions, Warren & Wetmore allowed themselves some play in the Adams style. The brick facade was decorated with terra cotta lions' heads ad other not-so-Adams motifs. And the extraordinary parapet was spiked with enormous 500-pound terra cotta sculptures wearing fruity garlands--some apparently depicting Bacchus, others less identifiable. The liberty of style would cause the Works Progress Administration's 1939 "New York City Guide" to call it "an example of the eclectic use of Italian Renaissance, Mexican, and Adam influences." The hotel opened on January 10, 1912 and three days later its fireproof boasts would be put to the test. On the fourth floor packing crates of excelsior stacked in a room suddenly ignited. Although the fire “burned intensely,” according to The Sun, it “did practically no damage.” The report of the New York Board of Fire Underwriters concluded that the confinement of “this intensely hot fire to a relatively small space” was due to the architects’ and engineers’ forward thinking designs. Alfred Vanderbilt had the top two floors of the new hotel outfitted as a private home for his family. 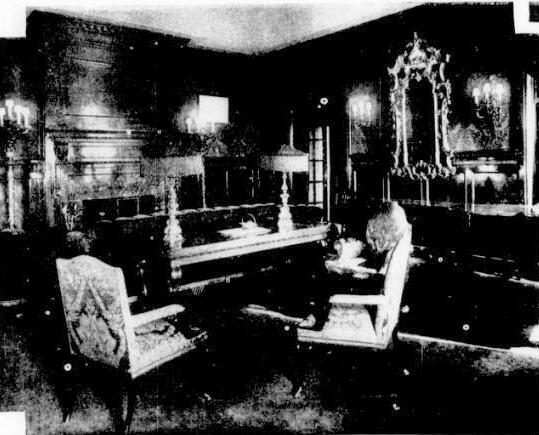 The New-York Tribune noted that the Vanderbilt Suite was “the equivalent of a complete town house.” He moved in with his wife, Margaret, their two sons and staff of servants. Below ground was a vaulted space known as the Della Robbia Room. Tiled in Gustavino tiles laid in a herringbone pattern, it was decorated by Giovanni Battista Smeraldi. Smeraldi made a name for himself painting the ceilings and walls of American hotels and civic buildings, changing his name to John B. Smeraldi. Art critic Helen Henderson approved of the décor. In her 1917 “A Loiterer in New York” she noted “The decoration of the Della Robbia Room of the Vanderbilt Hotel, done by Smeraldi, a clever Italian, in imitation of the famous Chambre des Singes, of the chateau of Chantilly, is an example of consistent and agreeable interior decoration, charmingly adapted to its destination." The lobby, clad in Caen stone, was decorated with sculptured panels by Beatrice Chandler. With labor problems put to bed, guests and full-time residents alike returned to their luxurious life within the halls of the Vanderbilt Hotel. Even as World War I spread, cancer-like, across Europe, America went about its day-to-day life, seemingly unaffected. But that would all change. In April 1915 Alfred Vanderbilt planned a trip to London. As a director of the International Horse Show Association, he was to attend a board meeting there in May. He also intended to present a fleet of vehicles to the British Red Cross while he was there. Margaret decided to stay home at the Vanderbilt Hotel for this trip and Alfred prepared to go alone, taking only his valet. Reportedly the couple laughed at the warning. For one thing, Freddy Vanderbilt had a history of escaping maritime tragedy. He had changed his mind one day before the RMS Titanic sailed, deciding on an alternative ship. Vanderbilt and his valet confidently boarded the RMS Lusitania that morning. They would never return. Eyewitness on board reported that as the Lusitania sunk, having been torpedoed by a German U-boat, Alfred Vanderbilt removed his life jacket and personally strapped it on to a mother holding an infant. Unable to swim, he realized his act of heroism would seal his own doom. His body was never found. 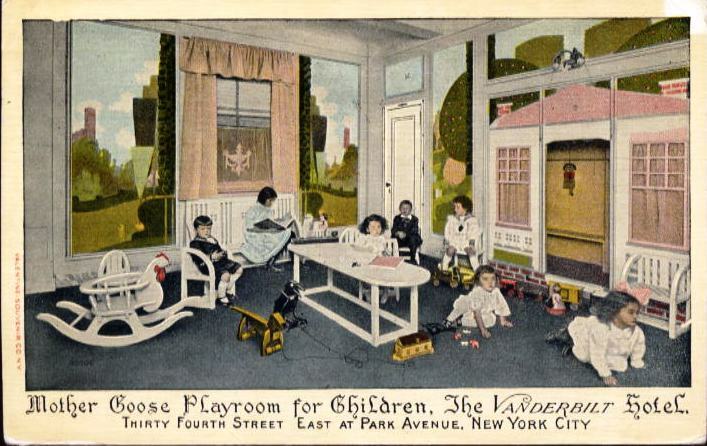 A 1915 postcard shows the charming Mother Good Playroom, one of two rooms specifically designed for children. Freddy's widow, Margaret Emerson Vanderbilt, an American divorcee and heir to the Bromo-Seltzer fortune, left the spectacular Vanderbilt Suite shortly thereafter. Early in January 1916 it was leased to the newly-founded Women’s City Club. The group was composed of women of vastly-varied backgrounds. In the meantime, downstairs the suites filled with the wealthy and the celebrated. In the spring of that year Howard Hughes and his wife arrived, soon to be joined by Howard Hughes, Jr., known as “Sonny.” Sonny was deemed by Hughes’s friends as “too over-refined, nervous, and sissified,” according to biographer Charles Higham. He had barely arrived when he suffered an attack of infantile paralysis while having an argument with his parents. The suite was transformed into a sort of hospital room staffed with 24-hour doctors and nurses. As it turned out, his sudden attack was merely his spoiled machination to obtain sympathy. The tenor filled the immense apartment with his artwork and the mementos of his illustrious career. He was in declining health, however, and in the spring of 1921 he left the Vanderbilt for Italy. Before departing, he ordered his secretary, Bruno Zirato, to crate up everything and have it shipped to Italy. “Who knows, Bruno? I may never get back to New York,” he said..
On August 21, 1921 the tenor died in Naples. On the day of his funeral, Enrico Caruso, Jr. passed the day in the Vanderbilt suite with Bruno Zirata. Howard “Sonny” Hughes, Jr. would come back to the hotel where he caused the earlier uproar. During his honeymoon in 1925 he stayed here with his new wife, Ella. He had had a pair of Rolls-Royce Silver Clouds, one for each of them, shipped to New York and waiting for them. Little had changed in Sonny and before the honeymoon was over he had tired of married life, preferring to spend his time in nightclubs with his friends. When journalist-humorist Ring Lardner’s East Hampton house was severely damaged by a storm in 1931, he and his wife Ellis Abbott took up residency at the Vanderbilt. On February 13, he began a letter saying “My health hasn’t been so good. I guess I am paying for my past.” In fact the writer was suffering from tuberculosis and a heart ailment which would lead to his death in 1933. 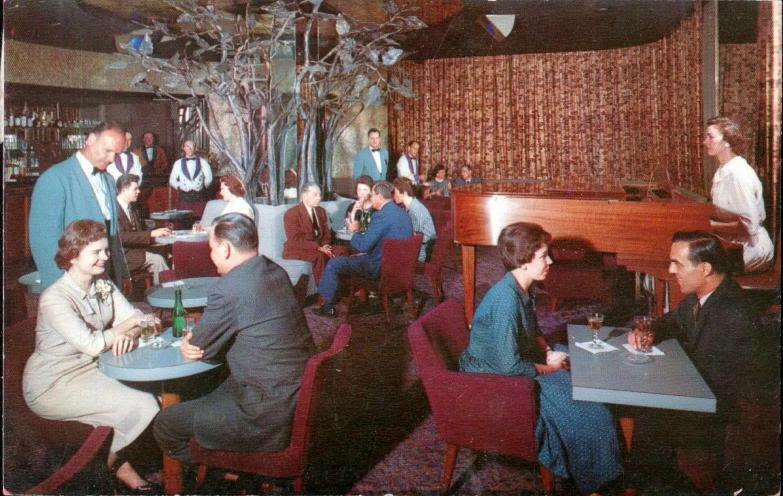 Patrons enjoy a drink in The Purple Tree Room in the 1960s. An investment group purchased the 54-year old structure with intentions of renovating it into a dual function office and apartment building. The top 18 floors would become studio and one-bedroom apartments while the lower floors would be offices and commercial space. Warren & Wetmore’s Adam-style exteriors on the lower floors were about to go. “New aluminum-and-glass curtain walls are being erected to sheath the office floors, while the masonry façade of the hotel will be retained on the upper stories,” said the article. But that was just the beginning of the brutality. When the new apartments were available for occupancy in 1967, among the first residents were Mr. and Mrs. Charles Wilson. The Wilsons had held their wedding reception in the Vanderbilt on July 4, 1953. Despite the vandalism of the lower levels and the partial decapitation of the parapet, Alfred Vanderbilt’s classy experiment in the hotel business still looms majestically over Park Avenue. about 15 or so years ago, Ebay offered a set of silver plated flatware that the seller claimed had been specially commissioned to furnish "Enrico Caruso's suite at the Vanderbilt Hotel". knowing that at one point the Vanderbilt had been owned by the Manger Hotel chain,I alerted a friend of mine whose grandfather had founded the hotel chain. He, in turn called his mother who recalled that as a newly wed (this would be in the mid 1950's) she and her husband had lived at the Vanderbilt, courtesy of her father-in-law, in what was always described as "Enrico Caruso's suite". The silver, alas, was unfamiliar to her. And were you able to discover if indeed, as rumor has it, there is a very grand railroad "station" deep under the Vanderbilt Hotel,constructed exclusively for the use of the Vanderbilt family? I'm sure the story is apocryphal, but it is oft repeated. I could find no reference to an underground rail connection to Grand Central; so I have a pretty good idea that the story is urban myth. But a good story, anyway! There are rumors about the 'secret' train station that was under the building. Alfred Vanderbilt did have a private train that went from the Vanderbilt Hotel to Grand Central Station and built the Park Ave Tunnel that goes from 33rd Street to Grand Central Station for that purpose. It is now used by cars. I believe the tiled ceiling of what is now Wolfgang's Steakhouse is the only part left from the Della Robbia Room. That ceiling is the only land-marked part of the building. The building has a basement and a sub-basement. I believe Enrico Caruso lived in the top two floor suite after the Vanderbilt family no longer lived there. The Waldorf, north of grand central station did have a private rail tunnel known as track 61. It was built in 1929. This may be the source of the urban legend. I am not aware of one running south, but I note, the vanderbilt's had private space in the actual terminal and the terminal itself is apx 49 acres, with a train shed going all the way to 27th street on the south. So, it is possible they had a place for a private car, although I've never seen it on any map. I found an old skeleton key from this hotel attached to a pendant with one side a lady playing a harp the other side is the name and cross streets, how would I find out if this is authentic? It is authentic. What room number is it? The room number is 1630. Do you know if anyone who would want it? Was wondering if you sold your key and how much you got for it. I have a room 531 key I want to sell. I have a white metal Skelton room key. Made by Yale & Towne Mfg. Room 531 Vanderbilt hotel. Are you interested? Tried to contact you on Google Chat. Please get in touch with me about the room key! If this 4 Park Avenue from 1942 I think this is where John Augustus Sutter lived! Remember the gold rush in 1840's on Sutter's land in California? John Augustus Sutter owned that land and lost everything and then his son JAS Jr created Sacramento, CA!! Anyway, JAS the IV lived in the Vanderbilt in '42. Please contact stickingtomystory@mindspring.com if you are interested in selling it. I have been performing structural repairs to the parking garage and basement of this building for the past year. old train platform or a loading dock for trucks..... it can't be for trucks since it is three floors underground.... must be for a train. The wall which is to the east, where a train would come from, looks like it was filled in at some point in time. From all that I have seen, I believe the train story to be true. For the garage worker: When you have a chance, please tell your boss you are the person I was looking for. He knows how to get in touch with me. I used to stay in the Vanderbilt in the 1950's and remember going down below to have a drink in what was called "The Crypt". The bartender was very good at mixing cocktails. I have a silver matchbox with sliding lid engraved-VANDERBILT HOTEL MATT CLUNE PROP. 42ND AND LEXINGTON AV. N.Y. IS THIS THE SAME HOTEL ? My dad Karl worked in this hotel in the 1960's as one of the building engineers his boss's name was Veto I forgot his last name, the engineers were a great bunch I got to visit my dad in the evening and he took me to the kitchen and I got a great steak dinner with all the trimmings plus a five scoop of ice cream with choc syrup whipped cream and cherries. they had water powered elevator's with a center post that went twenty three stories into the ground. My parents stayed here. 2/9/1945 and 2/10/1945. $4.00 a night can you believe it? I have the bill, $8.00!!! I love NY. I wish I could see this building. Is it just me, or could that woman at the table in the right foreground of the photo taken in the Purple Tree Room be Carol Burnett? It was taken right around the time she would have been in New York, I believe. I expanded the picture for a closer look, and it sure looks like her! There is a resemblance. And the timing is right--she was working in New York at the time. I imagine it's a coincidental look-alike; but who knows? Maybe you identified an early photo of a star! I have in my possession a silver and glass mustard style pot marked with Gorham, style 02152, silver soldered with a clearly labeled The Vanderbilt Hotel, New York tag on the base, Apparently from the opulent original dining area Beautiful greek style statues and columns. Anybody have any further information? Any information on the mustard pot can be forwarded to ronalddyak@gmail.com. Thanks.